Marvelous Multiagers! : What Went Right Today? This is a great linky party hosted by Confessions of a Teaching Junkie. Since we didn't have school today, my answers are more like a "what went right yesterday" situation. I love focusing on positives so here we go! And now I will explain! Transitions take us a while... which is something I want to focus on for next year. Yesterday, however, we somehow had like 3 minutes before it was time for lunch, so we got to play a little Silent Ball which we haven't played in months! I mentioned that I was thinking about starting a Homework Club to reward all the kids who do their homework and bring it back. Two of my boys who legit have not come back to school with finished work in many, many days have both brought their homework back since Homework Club started. I did a little happy dance both days and I'm pretty sure they think I am a weirdo. Haha! Whatever works!! I totally understand about transitions. We are constantly singing, counting, reciting poems, etc. during them. It sure can be frustrating otherwise, huh? I definitely want to know what happens for the Homework Club. Cause I have some kids who need some motivation! Smooth transitions are fictitious....I haven't seen them- I dont think they exist....just kidding....It is nice when it all works out- I glad you had a good day! I would love to know more info on your homework club. 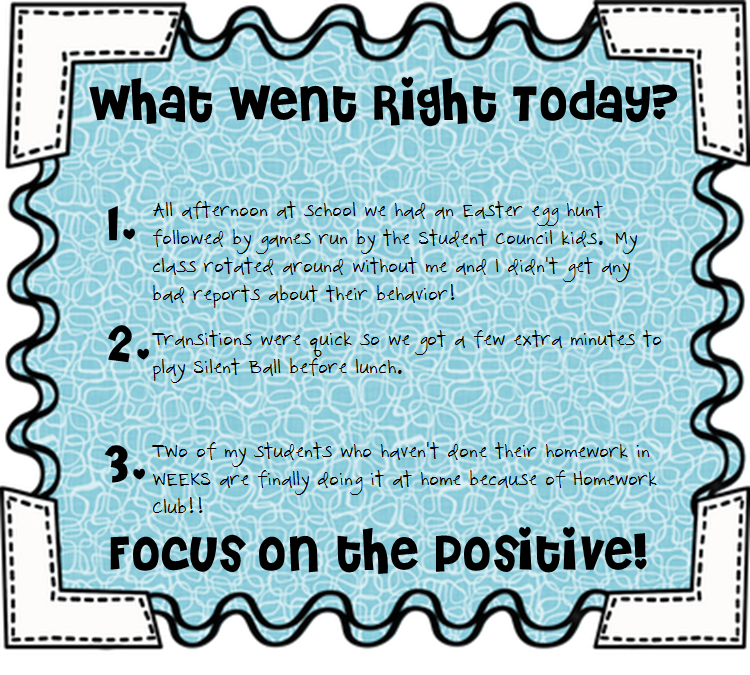 I have a student who has been struggling with homework throughout the year and I really want him to create great homework habits by the time he enters 3rd grade. Just stopping by to check out what went right with you today! I have mine posted, as well. Yay for those students that are finally coming around on doing homework. Your Homework Club seems to really be working! YAY! Come by when you get a chance! So glad I found you on here :) I teach a Grade 2/3 class this year and definitely understand the challenges and rewards to this!! Would love to hear more about the Homework Club. I have a few that never get theirs done! Thanks for joining my linky! I love making new friends! I am your newest follower!